Brant was still present in the lagoon and we spotted a solitary Snowy Plover who hadn’t decided to migrate north to the Central California coast, nor south to Bolsa Chica in Orange County. The area on the right hand side of the path to the beach was a source of worry to many old hands of SMBAS as it seems to be growing ragweed and pepperweed, among other invasive plants. The good news is that State Parks is well aware of the situation, but unluckily, they did not budget for exceptional early-growth weeding. 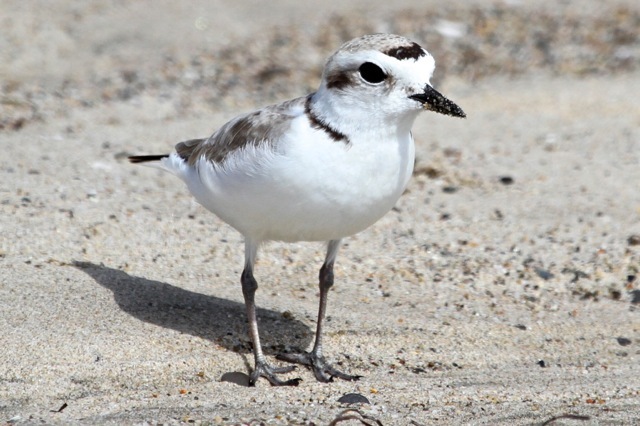 This Snowy Plover has an extremely thin black neck bar! A few days later, Least Terns were discovered nesting in the Snowy Plover enclosure, although they were not seen on 5/26. Eggs were present and mated birds were courting each other with gifts of small fish. State Parks rushed in additional fencing, volunteer observers were found and deployed. Unfortunately, the local American Crows also found the eggs and ate them all. This was the first known nesting attempt for the Endangered Least Terns since 1940. It’s possible that they may try later this season, and probable they will try in future years, as long as there is an area, like the enclosure, where people won’t go. Crows, unfortunately, follow no such rules, which is the reason they are a major barrier to the recovery of this species. 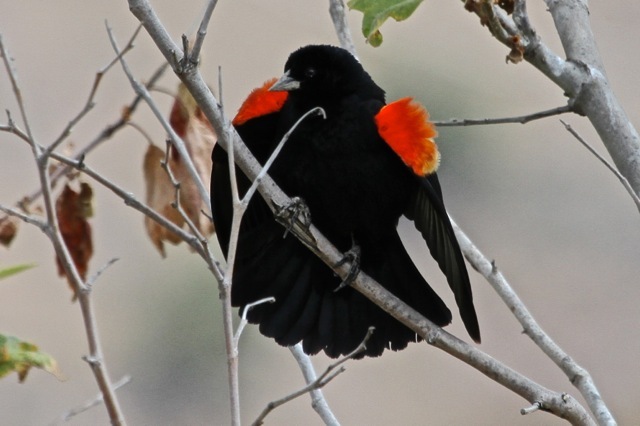 Our next three field trips: Malibu Lagoon, 23 June, 8:30am; Mt. Piños Birds & Butterflies, 29-30 June; Malibu Lagoon, 28 July, 8:30am. Our next program: Tuesday, 1 Oct., 7:30 pm. To be announced, as usual, from the blog. 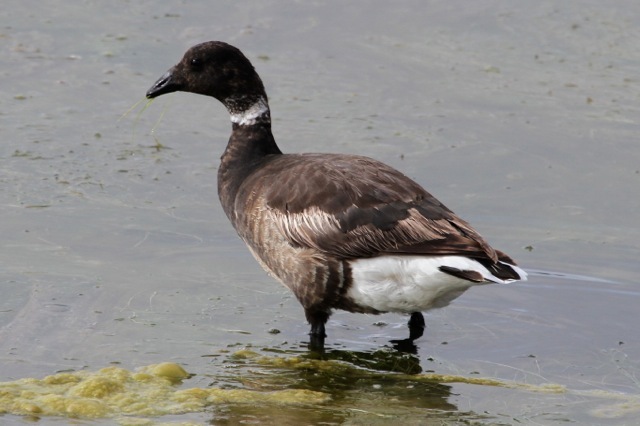 Total Birds: May total birds of 322 are 37% below the 6-year average; low numbers are mainly in the Ducks (-27), Brown Pelicans (-123), Coots (-16) and Passerines (-34), mostly in Starlings, no great loss there. Summary of total birds from the 6-year average so far: June +36%, July -9%, Aug. -9%, Sep. +12%, Oct. +3%, Nov -5%, Dec +30%, Jan -20%, Feb -29%, March -30%, April -34%, May -37%. Increasingly downward. Species Diversity: May 2013 with 46 species was 3.4% above the 44.5 6-year average, a minor variance. Summary of species diversity from the 6-year average so far: June -10%, July +10%, Aug. -6%, Sep. -20%, Oct. +5%, Nov +2%, Dec -4%, Jan +2%, Feb -8%, March +9%, April -2%, May +3%. Tide Lo/Hi Height L +0.1 H +3.7 H +3.76 L -0.13 L +0.38 H +4.08 Ave. Totals by Type 5/25 5/24 5/23 5/22 5/27 5/26 Ave.
Total Species 5/25 5/24 5/23 5/22 5/27 5/26 Ave.
← The Ribbon is Cut at Malibu Lagoon! A personal view.